Mac Rath means in Gaelic Son of Grace, and of its many English spellings the Irish form Magrath is the one that best preserves its original pronunciation. The clan appears to have inhabited the lands of Clunes in the Beauly district in the 12th and 13th centuries and removed to Kintail in the 14th century. The most famous Highland branch is that of Kintail in Wester Ross, which was erected as a barony for the Chief of the Mac Kenzies in 1508. Kintail's stronghold stands on Eilean Donan in Loch Duich. This castle was held for them by the Mac Raes, who became known as "Mac Kenzie's shirt of mail". The Mac Raes profited by the Mac Kenzies' expansion into Mac Leod lands. After the Reformation, the Mac Raes added to their warlike reputation in the fields of religion and literature. Duncan Mac Rae of Inverinate was the compiler of the precious Gaelic anthology known as the Fernaig Manuscript. He was also a devout Episcopalian and an example of the cultured aristocracy of the Highlands which, during the next century, was to be destroyed. It was in 1774, while this process was at its meridian, that John Mac Rae emigrated from Kintail to America just in time to fight on the wrong side of the War of Independence, and to die during his imprisonment. Before he did, he composed the Gaelic songs that were carried back across the Atlantic. 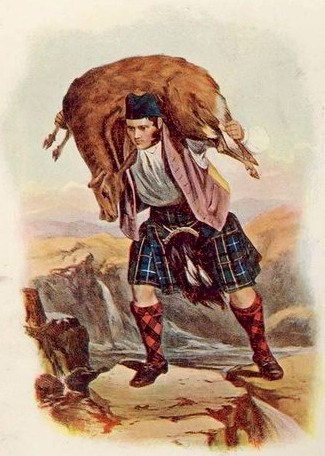 These songs of Iain Mac Mhurchaidh as he is known, have been preserved by J. C. M. Campbell, whose mother was a Mac Rae, and who grew up near to Eilean Donan in Kintail.